The Journal of Extension (JOE) is the official refereed journal of the U.S. Cooperative Extension System. The acceptance rate for articles is 27.8 percent. Most submissions undergo double-blind review. Contributing to JOE is a great way for Extension staff to engage in scholarly publication. I’m proud of the fact that Michigan State University Extension boasts two articles in the August 2015 issue. “The Case for a Paradigm Shift in Extension From Information-Centric to Community-Centric Programming” was written by Emma Strong, graduate research assistant; Jason Rowntree, associate professor in the Department of Animal Science; Kable Thurlow, Extension educator in the Agriculture and Agribusiness Institute; and Matt R. Raven, professor in the Department of Community Sustainability. In the article, the authors assert that the current Extension paradigm of information-centric programming is no longer adequate and Extension should move toward one that is community centric. “College Transition Study Shows 4-H Helps Youth Prepare for and Succeed in College” was written by Judy Ratkos, senior program leader (now retired), and former research assistant Lauren Knollenberg. The article gives the results of a study that showed 4-H alumni rated significantly higher than the comparison group on six life skills constructs. The publication is a rich resource of the work being done around the country by our Extension colleagues. If you’re not reading it, you’re missing out. If you’re not publishing in it, you may want to. Our Michigan State University Extension staff members have a wealth of experience, expertise and efforts. Often colleagues may not be aware of the exemplary efforts and corresponding outcomes achieved by their peers. A great way to share the learning is to publish in the Journal of Extension (JOE). JOE is the official refereed journal of the U.S. Cooperative Extension System, written, reviewed and edited by Extension professionals. Peer review is rigorous: currently, 27.8 percent of submissions are accepted. The June 2013 issue contains an article written by MSU Extension public policy specialist Claire Layman, Kellogg Biological Station education and outreach coordinator Julie Doll and Extension evaluation specialist Cheryl Peters. “Using Stakeholder Needs Assessments and Deliberate Dialogue to Inform Climate Change Outreach Efforts” discusses the use of a participatory decision model “deliberation with analysis” to inform climate change programming around agriculture. In that same issue, MSU associate professor Wynne Wright and research assistant Katherine Nault wrote about “Growing Youth Food Citizens.” The article covers the research done on involving youth in seeing themselves as food citizens capable of improving their food environment. I encourage you to take the time to read the articles. You’ll learn from them. At the same time, start thinking about your own involvement in programming. Perhaps you’d like to write about it and submit your work to JOE. Several Michigan State University Extension educational materials received awards at the Association of Natural Resource Extension Professionals (ANREP) biennial conference in Hendersonville, N.C., May 20–23. The publication Certified Natural Shoreline Professional Training Manual: Principles of Natural Landscaping and Erosion Control on Inland Lakes (MSUE Bulletin E3109) received a 2012 Gold Award in the category of Long Publications. Jane Herbert, senior Extension educator, served as the lead author and coordinating editor. Bob Schutzki, associate professor, and Mary Bohling, Extension educator, were contributing authors along with several members of the Michigan Natural Shoreline Partnership, including the Michigan Department of Environmental Quality. The manual was produced by ANR Communications. This attractive 140-page manual is used to train landscape professionals in how to design, construct and maintain environmentally sound inland lake landscapes. It’s a great example of how MSUE professionals work with their colleagues in the public and private sectors to address needs. 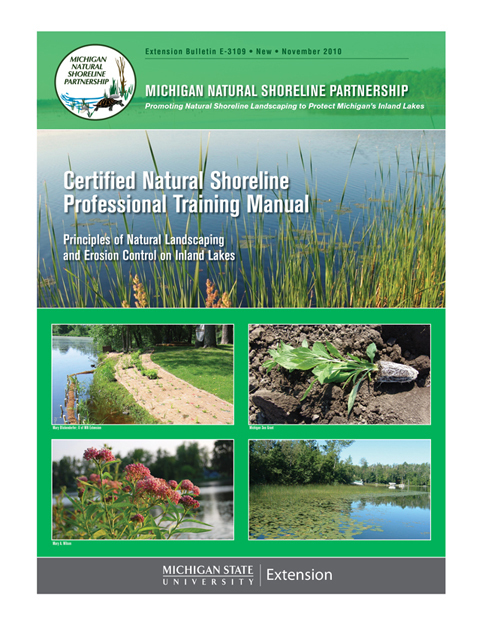 This manual, and the certification training program in which it is used, are equipping landscape professionals to expand business services to include more lake-friendly tools and techniques to protect the quality of Michigan’s inland lakes. The Journal of Extension article “Conservation Education for Advancing Natural Resources Knowledge and Building Capacity for Volunteerism” received a 2011 Gold Award for a Refereed Journal Article. Co-authors were Shari Dann, associate professor in the Department of Community, Agriculture, Recreation and Resource Studies; Shawn Riley, associate professor in the Department of Fisheries and Wildlife; and Heather Van Den Berg. Heather, a graduate assistant, was lead author. Senior Extension educator Dean Solomon’s conference poster “Public Deliberation Tools for Natural Resources Extension Professionals: A Case Study” received a 2012 Honorable Mention award. The Food System Economic Partnership (FSEP) has been a key piece of our programming in southeast Michigan since its inception in 2005. This combined effort of five county government administrations, MSU Extension, and community groups has worked hard to put a face on local foods in that part of the state. This article in the August 2009 issue of the Journal of Extension (JOE) takes a critical look at FSEP and its role in the land-grant model. Special thanks to Brenda Reau, Monroe CED; Wynne Wright, associate professor in the Department of Community, Agriculture, Recreation and Resource Studies; and Kathryn Colasanti, Graduate Research Assistant with the C.S. Mott Group for Sustainable Food Systems for doing the research and putting this information together.